Irene is a two column blogger template with sidebar to its left and post section to right.The theme is designed by web2feel and converted by me to blogger.The design is really great.Top menu page links are ready for you.Seo for title has been done and it supports all blog features and is compatible with all browsers.It has search bar also ready at top of sidebar.Best part about the template design is the use of header widget at top of sidebar instead at top of blog.Custom font has also been used for headers and blogger read more feature also working. 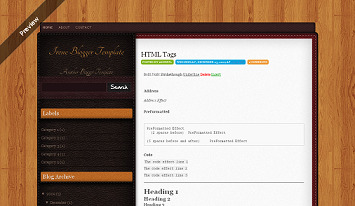 Other blogger templates you may like are Work-A-holic and Little World. i will like to place the scribe via rss and twitter in my blogger template just like you did. how do i organize all to be like you have it here. i like this template you are currently using. is it available for download?